Every October I travel back to Michigan (I went to college at the University of Michigan) where I have a little reunion with my friends. We rent a house on Lake Michigan and just relax, eat amazing food, and have fun. Last year my good friend Luke proposed to his then girlfriend, Shiloh and she accepted! The wedding was set for August 26, 2011 and they wanted to include as many of their friends in the wedding as possible. Despite never really taking people pictures they asked me to be their official Wedding Photographer! Of course I accepted. I was pretty nervous about taking wedding photos since I’ve never really dabbled in people photography (I tried briefly about a year ago). A month or two ago one of my co-workers got married and I decided I would use their wedding as a ”test case”. I learned a lot about how to shoot a wedding and had a bit of fun but was ultimately disappointed by the results. I spent a lot of time since then researching proper poses, where I should be to get the right angle for certain shots, etc. 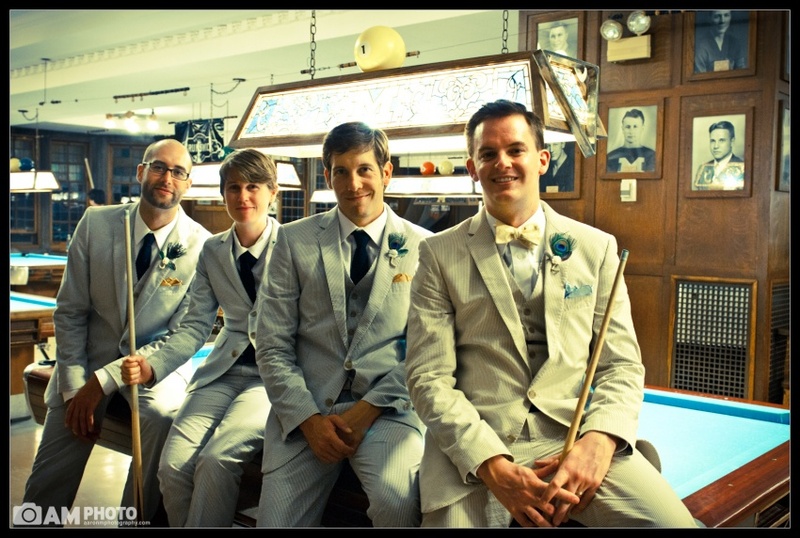 The wedding was the Michigan Student Union and on our way out we passed the billiards room. I figured this would make a great place for a photo so I grabbed the groomsman and we took a couple photos in there! Super fun! Congrats to Luke and Shiloh! Well Luke and Shiloh got married and the photos actually came out pretty good! The one thing I would have changed would have been to buy or rent a D700. There were times I had to bump the ISO way way wayyyyyyyy up and my little D300s did great but was pretty noisy.